Saints centre Piers Francis has been added to the England squad ahead of Saturday's clash with Australia at Twickenham. Francis impressed for his club last weekend, scoring in the 36-17 Gallagher Premiership win against Wasps at Franklin's Gardens. 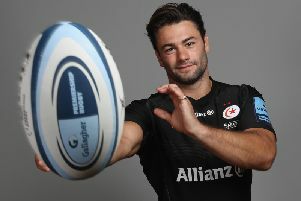 And he has been rewarded with a call-up by England, who have assembled a 28-man squad ahead of their final autumn international. Dylan Hartley, who scored in last weekend's 35-15 win against Japan, and Courtney Lawes remain in camp. Elsewhere last weekend, Dan Biggar was the star of the show for Wales, with the Saints fly-half racking up 19 points in the 74-24 victory against Tonga. Man of the match Biggar will hope to get another start when South Africa head to Cardiff on Saturday. Full-back Ahsee Tuala was in action for Samoa last weekend, scoring a try in the 27-19 defeat to Georgia. Tuala will again aim to be involved this Saturday, when Samoa face Spain in Madrid.